The long awaited debut of Yo Gabba Gabba on Nick Jr., the new preschool television show with a wonderfully fresh approach to learning, has finally arrived! An early pilot for the show first appeared online in mid-2006, making a viral splash, and caught the attention of a number of executives in the broadcast world. Nick Jr. made it official at the start of 2007 with an announcement that the show would start airing late this summer. A number of preview clips have been available on YouTube and OnDemand cable services. As of this week the show can be seen about mid-morning each weekday throughout the country! 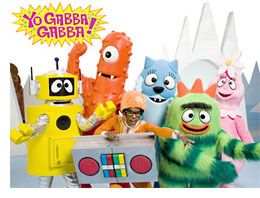 Yo Gabba Gabba is like a Saturday Night Live variety show for preschoolers. Each episode is punctuated with interesting musical guest stars, clever animation “mini-shows” and fun and quirky shorts of retro video games and dancing kid clips. Dance and movement are the underlying theme to almost every aspect of the show. Many performers slated to appear on the show include: Mark Mothersbaugh of Devo fame and critically acclaimed music aeficianado of film and television, The Aquabats, The Aggrolites, Biz Markie, The Shins, Sugarland, The Salteens, Smoosh, Mya, Sean Kingston, Nikki Flores, Rahzel, Cornelius and Shiny Toy Guns. The show also promises other surprise appearances from guests like Tony Hawk, actor Hector Jimenez, Elijah Wood, Laila Ali, and others. The first season of Yo Gabba Gabba will include 20 episodes. Much like any new show, it takes some time to hit your stride and find that natural beat. The first few shows are good; some parts are stronger than others in their appeal, but an improvement in show quality can be seen from episode to episode. The second show, themed “Summer”, is very entertaining. The performance by the band The Aquabats with their song “Pool Party” has made me an instant fan of the group. 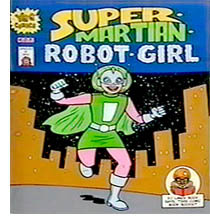 A segment called “Cool Tricks” where kids (and sometimes adults) show off a unique skill they have learned, and a re-occuring animation segment called “Super Martian Robot Girl” are also very entertaining. I thought this show was good, and then I saw the fourth episode called “Dance”. 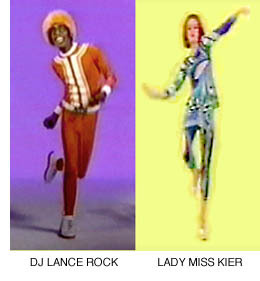 It was just plain rockin’ with great rap music, a “red-light, green-light” approach to dancing for youngsters, and striking video effects that made me feel like going out to a the dance club! I’ve seen a wonderful progression in the quality of music over this short span of shows and am eagerly awaiting more of the same with shows yet to air. So, as a Gen-X’er, I’m hooked. I’ve been waiting for this show ever since Pee-Wee’s Playhouse stopped producing new shows. But will young children like it? You bet! Strong rhythmic music and encouraging movement is an excellent way to grab the youngest of viewers. The visuals are fun and appealing. There are many parts of the show young children can relate to directly and others that will create an aspirational desire to try something new. It encourages children to feel good about moving and not to worry about “doing it the wrong way.” Make sure your living room floor is clear, because these future young hipsters will get up off the couch and start moving and grooving soon after the show begins. You just might find yourself dancing around to the show as well. In my mind, children’s television shows can be grouped into two camps. There are shows that children and adults can watch, love, and learn from together. Then there are shows that children will watch and adults can’t stand. Yo Gabba Gabba is one for young and old alike with plenty to please both groups. The show is very entertaining in a fresh whimsical style wrapped in cool pop culture, animation, music and dance. Get ready to hear lots more from this clever, unique, and inspiring show! This entry was posted on Thursday, August 23rd, 2007 at 3:24 pm	and is filed under Age 03/Toddler, Age 04/Preschool, Age 05-06/Grade Pre-K/Child, Parents/Caregivers, Television, Video Links. You can follow any responses to this entry through the RSS 2.0 feed. You can leave a response, or trackback from your own site. We love this show. It’s the one kids show that both our (nearly) 4 year old and our 18 month old both get into, and you are spot on about parents enjoying it, too! My “2”-Year Old & I Just LOVE “Yo Gabba Gabba”!!! Even My “13”, “12”, & “7”-Year Olds Get Into The Show As We Faithfully Watch It Everyday At 1:30P.M., 10:00P.M., & Then Again At 10:30P.M.! My Baby Girl Knows ALL Of The “Yo Gabba Gabba” Gangs Names Already & She’s Always Running Around Saying, “Break It Down!”–She’s So Cute! “Yo Gabba Gabba” Is Our FAVORITE Show!! !